I just returned from India, where I had the opportunity to attend the Global Spa and Wellness Summit in Delhi, which kicked off with a congress on the rise of Wellness Tourism. 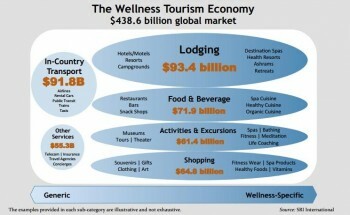 The easiest way to define wellness tourism is by differentiating it from medical tourism. Medical tourism involves people traveling to a destination in order to receive medical services they need that are either inaccessible or unaffordable in their home region. 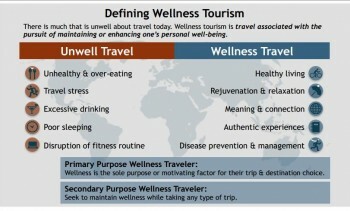 Wellness tourism describes healthy travelers seeking to enhance their health and well-being while they are traveling. If medical tourism is a reactive response to a medical condition, wellness tourism is a proactive approach to seeking wellness. I take these numbers with a grain of salt because of the broad definition the researchers used. 85% of this revenue comes from “secondary purpose wellness travelers” or those who are pursuing wellness activities while traveling even though this isn’t the primary purpose of their trip. And the revenue includes non-wellness expenditures from their trips. But at 14% of expenditures, $61B for the “primary purpose wellness travelers,” or those who are travelling for the express purpose of pursuing wellness activities, still represents a big number. The report also shows that primary purpose wellness travelers spend significantly more money: $2066 per trip compared to only $680 for a secondary purpose traveler. And as Ophelia Yeung from SRI points out, “it’s important to realize that the primary and secondary purpose wellness travelers are often the same person” taking different trips at different times for different reasons. Unfavorable Demographics: aging boomers in the US and the high ratio of males to females in China is making wellness more of a challenge in key markets. Geopolitical Rebalancing: following Bhutan’s example of a government based on “Gross National Happiness” (I’ll have more on this in the next couple weeks) many countries have been looking at wellbeing measures as important indicators of the success of a nation. Economics: the rising costs of health care suggest that governments will increasingly incentivize or even mandate wellness. Complexity: In an increasingly complex world, our cognitive functioning is constantly being exhausted. We need services and activities that can strengthen and replenish our minds as well as our bodies. Transparency: In today’s world, where personal information is widely available and it is harder to hide, wellness and beauty continue to command a premium in the global market place. Thanks to a variety of converging trends, wellness seems to be a very good investment indeed. Peter Greenberg, the Travel Editor for CBS News agrees. He played an active role throughout the entire 3 day summit and said that Wellness Tourism encapsulates three human values that “transcend all demographics”: health, economy and travel. Thanks for sharing your thoughts re the SRI International report and some of the speaker remarks at the Summit. I always appreciate your analysis as you have a unique vantage point. I also look forward to hearing more about your reaction to the presentation on Bhutan’s Gross National Happiness Index. (Let me know if you would like to access the entire powerpoint because sadly there was a shortage of time for the presentation.) While the PP will go up on the GSWS website in several weeks, you may want to access it sooner as I know this is an area of interest and expertise for you. I did want to add one thing to your analysis if you don’t mind. It is a small point perhaps nevertheless something important for our industry to know. When it comes to medical tourism, while we do think of that as involving people who are sick and HAVE TO do something about their health (versus those who WANT TO to seek experiences that will enhance their health, wellbeing and quality of life)…there is the issue of plastic surgery that often falls into the “want to” category although is for the most part in medical tourism. It is in fact a big part of medical tourism. It might be interesting at some point to explore the gray areas (and there certainly are some where medical tourism and wellness tourism overlap) and also ask the question of how the idea of “I need to have plastic surgery or I will not be happy” might figure into the “need to” arena. As you did so well with helping our industry see that pampering is part of wellness, I think a case can be made that plastic surgery can be a “need” possibly more often than we might think. And finally..wasn’t it fascinating to hear Thierry Malleret talk about the possibility that at some point in the future “wellness may become mandatory”? Hmm….now that will be a good time to be in the spa industry!! This also ties in to some of the mind-body motivations that the spa world has been so good at considering. The reasons that people have plastic surgery and the reasons that people would travel to have plastic surgery will transcend the lines between mind and body. Congratulations on a truly amazing event. Stay tuned for more articles on the Dalai Lama, Bhutan and more. I’ll reach out to you for slides, thanks for the offer! Good conversation, you two! I’m glad this topic is finally receiving the attention it deserves – I was beginning to think that my references to wellness tourism and medical tourism (pp. 205-206 in my book “Getting Great Spa on the Road to Wellness) had been relegated to the back burner and making it a separate issue at the 2013 GSWS put it back in the forefront of the industry’s collective consciousness. Thanks for this post, Jeremy, and I look forward to further posts resulting from what must have been an outstanding and highly motivating conference! As always, thanks for sharing. 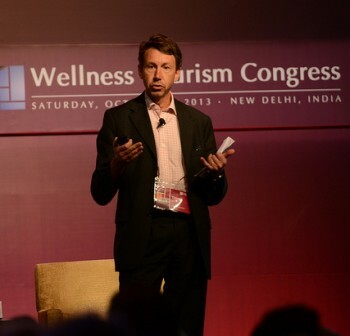 I have seen the trend of the past few years and if we look at all of the research, wellness travel is poised to grow. One thing that wellness travel experts don’t seem to focus on as much is mental wellbeing. From personal experience, my wellness travel includes retreats for the mind where I can find and experience personal transformation experience and enjoy concepts of positive psychology. I am wondering if you have heard much about this aspect and where it might be going? Fascinating article and many thanks. I was disheartened recently to read Bhutan’s new leader has abandoned the Gross National Happiness Index due to the dire state of his poor nation. He cited internal prosperity materially was more important than happiness. I was curious if this came up at the conference. Jasna, I couldn’t agree more. Even in the spa industry, where we define ourselves around “body, mind, & spirit” wellness, there is an emphasis on the physical aspects. But I do think this is changing. Increasingly people are realizing that vacations are less about resting the body and more about resting the mind. In the talks I give on “The Psychology of Spas and Wellbeing,” I refer to spas as a “vacation for the mind” citing the importance of having a place to go to separate from technology, experience silence and have time to think/reflect/meditate/etc. We heard from Dasho Karma Ura (I love his name), the President of the Center for Bhutan Studies and he presented on Gross National Happiness without any indication of a withdrawal from this position. But I also had the opportunity to speak with some friends who attended the summit immediately after visiting Bhutan. Hearing their perspective helped me understand better the complexiities of what Bhutan is going through and why the current PM may be shifting gears. I think they have perhaps swung too far in the happiness direction and are now experiencing a needed correction. But hopefully they won’t abandon GNH altogether. I will post an article on this in a couple of weeks, so stay tuned for that.